(R,R)-tartaric acid is the naturally occurring form. Its mirror-image enantiomer, (S,S)-tartaric acid, as well its diastereoisomer, (2R,3S)-tartaric acid, can also be synthesized. The last is called the meso form and is superposable with its mirror image. Thus the chirality of the two asymmetric carbon atoms cancels and this molecule is not optically active. Thus there is no variation in with concentration of (R,S). Equal concentrations of (R,R) and (S,S), called a racemic mixture, also exhibits net cancellation of optical rotation. 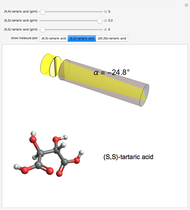 In this Demonstration, you can choose concentrations for the individual stereoisomers or mixtures of tartaric acid and observe the resultant optical rotation. 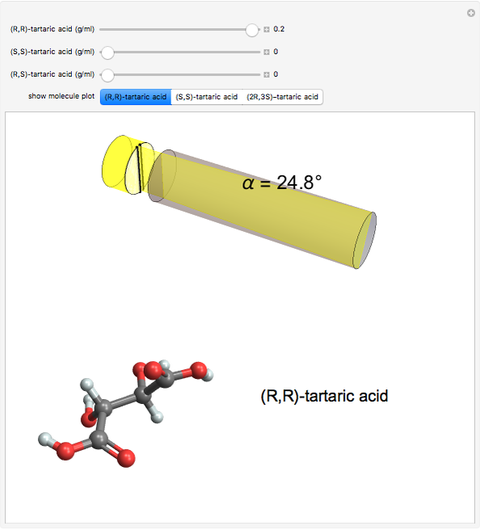 You can rotate the 3D diagram of (2R,3S)-tartaric acid to show the configurations around the R and S carbon centers. Louis Pasteur in 1848, using a pair of tweezers and a magnifying glass, was able to separate individual crystals of sodium ammonium tartarate tetrahydrate that were mirror images of one another. (Tartaric acid is found in wine, one of the earliest targets of pasteurization.) Pasteur found that, in water solution, the two varieties were optically active, with equal concentrations of the two different forms rotating the plane of linearly polarized light by exactly the same angle, but in opposite directions. Later, van 't Hoff and Le Bel proposed that the different forms—called stereoisomers—of optically active compounds were right- and left-handed versions of the same molecules, with the chirality (handedness) originating from asymmetric carbon atoms bonded to four nonidentical groups. Tartaric acid HOOC-C*H(OH)-C*H(OH)-COOH (2,3-dihydroxybutanedioic acid) has two asymmetric carbon centers, which are marked with asterisks. Since 1966, the nomenclature for absolute configuration of stereoisomers have been based on the Cahn–Ingold–Prelog system. This replaces the older D (dextro) and L (levo) classification (which is still in use in some biochemical literature). According to the modern system, the four groups attached to the asymmetric carbon are classified by priority, numbered 1 through 4. The details of this classification are given in any up-to-date organic chemistry textbook. For present purposes, we need only consider the four groups around the asterisk-marked carbon atoms in tartaric acid, which have the priority ordering OH > COOH > CH(OH)COOH > H. Now imagine the lowest priority substituent (H) to be the steering column of an automobile and the , , and priority groups to be arrayed around the steering wheel. If the ordering 1 2 3 is clockwise, as if performing a right turn, the configuration is called R (Latin rectus = right). If it is counterclockwise, as in a left turn, the configuration is called S (Latin sinister = left). 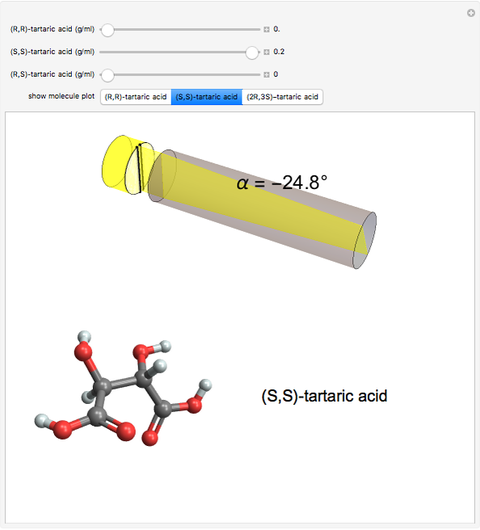 See any modern textbook on organic chemistry. S. M. Blinder "Optical Activity of Tartaric Acid Stereoisomers"